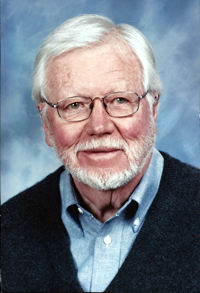 Dr. Robert L. Jensen, 86, of Hailey, Idaho, passed away Tuesday, Sept. 9, 2014, in Gooding, Idaho, at De Sano Place Assisted Living due to Alzheimer’s disease. Robert was born April 26, 1928, in Bend, Ore., to Lowell Jensen and Helen McLaughlin Jensen. He attended Catholic grade school and graduated from Bend High School. After graduation, he attended Portland University for four years, then the University of Oregon Dental School where he graduated in 1955 as an honor student. He married Delores “Punky” Twombly June 26, 1954, in Portland, Ore. Upon graduating, he served in the U.S. Army in Korea for two years. Later, they settled in San Jose, Calif. Punky and the children moved to Pinecrest, Calif., where the children began ski racing. Bob would spend four days at his dental practice in San Jose, then come to the mountains for Friday, Saturday and Sunday. They later moved to Hailey, Idaho, to enjoy skiing the greatest mountain. He bought Dr. Art Richards’ dental practice in Sun Valley where he practiced until retiring in 1994. Bob loved skiing and fly fishing at Silver Creek. He was very active at Our Lady of the Snows Catholic Church in Ketchum. Surviving family is his wife, Punky Jensen; children Christopher (Mary) from Swiss Home, Ore.; Joelle (Mickey) Rathsam from Hermitage, Tenn.; Kirk Jensen from Hailey, Idaho; Tia Jensen from Littleton, Colo.; grandchildren Sarah (Bryan) Sarfati, Ryan (Cathy) Rathsam, Amanda (William) Britton and Wesley Jensen; and great-grandchildren Nora, Wyatt and Penelope. Bob was preceded in death by his mother Helen, his father Lowell and son Mathew. The family gives many, many thanks for the loving care from everyone at De Sano Place and Hospice. The funeral mass will be held at 11 a.m., Monday, Sept. 22, 2014, at Our Lady of the Snows, with Father Justin Brady officiating. Arrangements are under the care of Wood River Chapel. Friends may visit www.woodriverchapel.com to light a candle, leave a condolence and share memories.